There are a couple of other threads on the Funbat, including the great review by Josh squared. However, I still thought it'd be fun to chuck my funbat build on here. 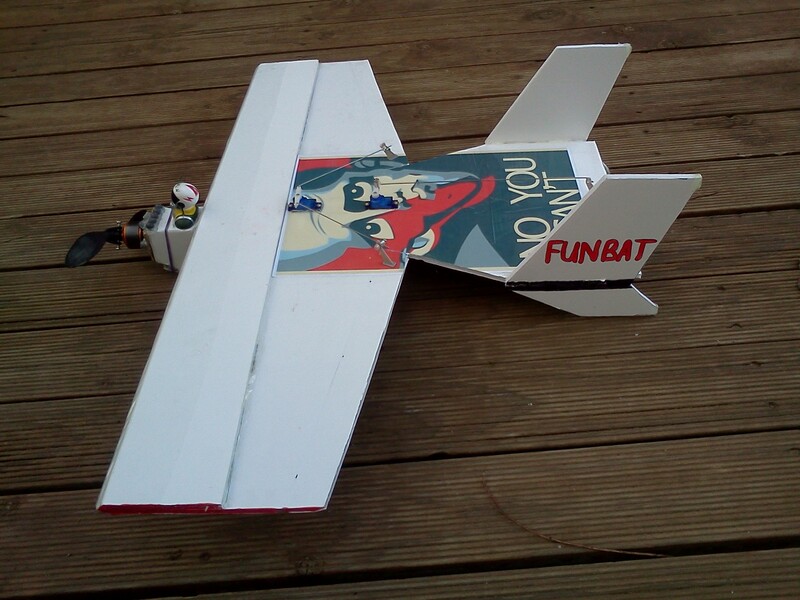 Using the same foamboard as per the p51 profile, I've built a Funbat exactly as the plan specifies. I've chucked a 2205 1400kv on it and my favourite movie poster. Other than that, it's waiting for some servos to be freed up (probably from the predator). That's awesome if it is what I think it is! (the poster, that is). I know, isn't it brilliant?!? Love Megamind! OK, CoG conundrum... With a 1600mAh battery, it comes out at 462g and positioned at the nose gives the balance point at about 7cm (2.75"). 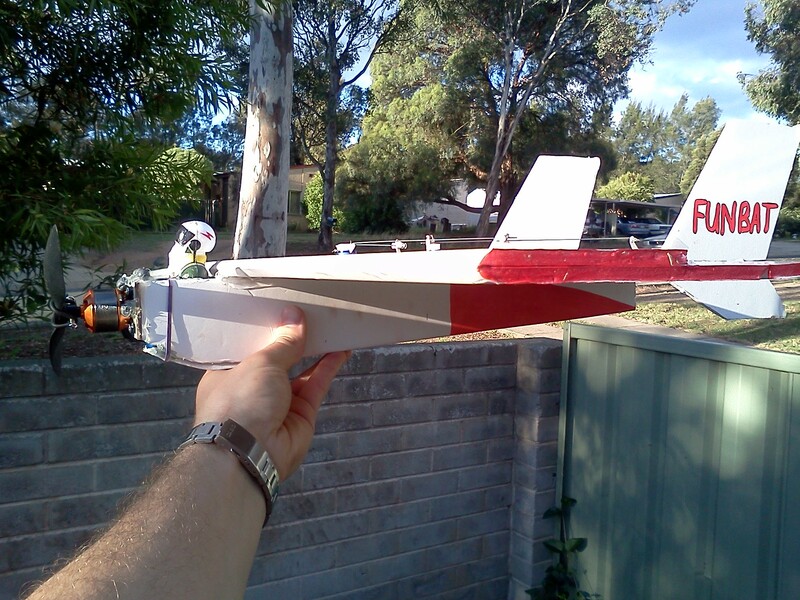 My 1000mAh battery gets it down to 400g but the balance point is another 1.5cm back (exactly at the airfoil step)... The recommended CoG on the plan is 1.75" (4.5cm). 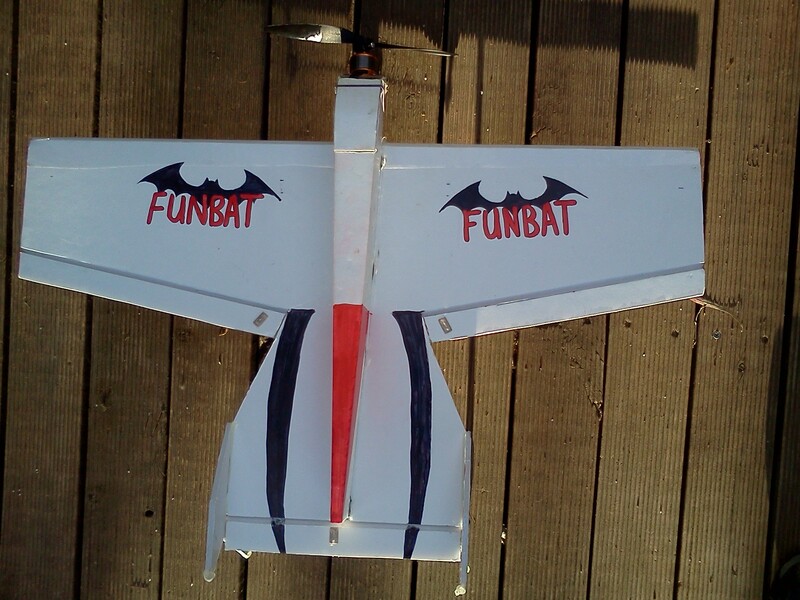 What are people generally running the CoG at with their funbats? Put the 2210 on it, but still needs weight in the nose. At least it's got enough grunt to cope with it though. I had to add about 50g of nose weight to balance it at about 2.25" from the leading edge. Wish I could have built the nose a little longer, but oh well. The motor is more than strong enough to carry the extra weight. Maidened today in strong wind 20-25kph and it climbed happily. Had to trim the elevator down to level it out. Flew pretty well considering the wind. Rolls like crazy. Really hard to tell the plane's orientation when it's about 60m away from you, but there's a simple solution for that. Exceptionally easy maiden. Plane glides like a dream too. Wish I had somebody to video it for me. 50 gram clock motor - speed controller close to the motor. 850 mAh 3S LiPo as far back in the body i can press it. The speed is not exceptionally - slow against the wind when 14 m/s. Next setup will be 25 gram motor and 2S 350 mAh battery - but the battery will be placed at the firewall. A couple of pics of my cool little plane. @pgerts, I'm surprised it's not really tail heavy! My next one will have an extended nose so I don't have to add weight. Nice pilot you got there in the front and the paintjob is nice! That's a really smart idea. 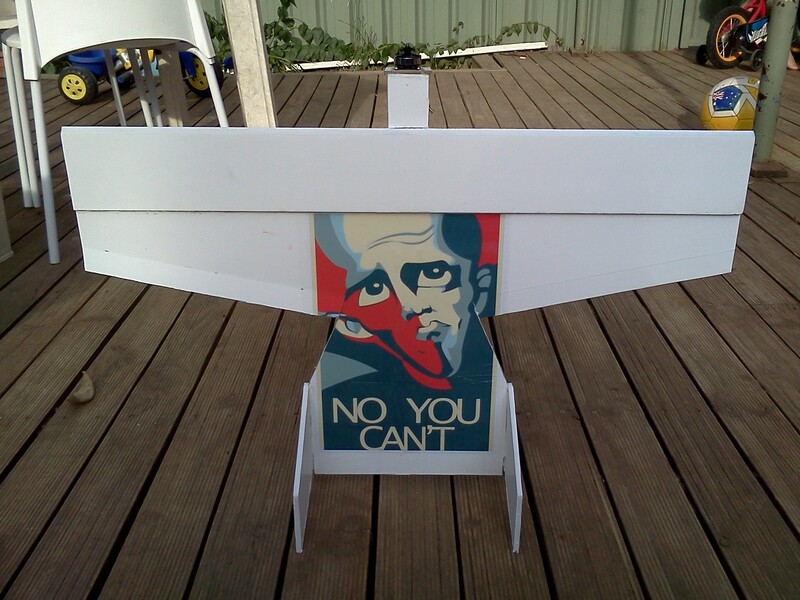 I (tried) to use that for my failed Piper Cub build. We have to get a combat session going. I'll just fly circuits and wait for you to crash! Bring it on! I've just finished repairing it. New, longer nose, negating the need for extra weights. My little pilot needed some surgery to recover from near-decapitation, but all in all, we're OK. I've also changed the 8x6 slowfly for a 7x6 APC. I'll participate on my simulator. Well thanks to Lobster for my little present. As soon as I have my bat ready it'll be combat time. Get those streamers ready!